We originally told you about the impending demolition of the former T.L. Osborn complex back in November 2008. The former home of the Osborn Ministries, their Interstate Temple and the bizarre World Museum were being razed to make room for the widening of I-44. This last week the demolition revved into high gear. This photo was snapped just hours before the landmark parabolic roof structure (we always called it the Conch) was leveled. It was a sad end to a unique building that has been etched into the memories of millions of cross-country travelers. Shane Hood passed along this graphical nugget from a period trade magazine. 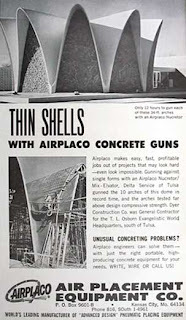 Ironic reading the blurb about how quickly the concrete arches were created. 12 hours up, 12 minutes down. Oh well. Thanks for snapping your photo for the history books!